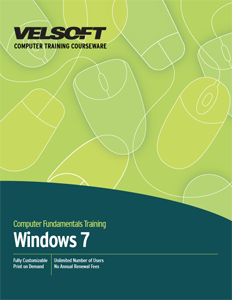 Windows 7 Advanced Training Materials are designed for trainers to develop advanced desktop skills for employees in the workplace. Confidently teach supervisors and staff how to use the control panel, common customization tasks, modify screen resolutions, set accessibility options, network and more! Seeing is Believing This sample manual to teach Windows 7 - Advanced is in MS Word format. Just as you would expect with any advanced courseware, a certain degree of understanding of the topic is required. Using Microsoft's Windows 7 can be an easy thing to use - for basic purposes. When it comes to understanding the more complex functions you need a working knowledge. Some of the things you'll learn about in the Windows 7 Advanced level are networking with Windows 7, advanced customization tasks, and system security. These features, added with the many more in the courseware, are made even better when you learn that when you purchase the material, it's yours with no future costs. With Trainingmaterials.com you'll never have to pay an annual licensing fee. And, it's all print on demand. You only need to print what you want, and whenever you want to. Download a free sample of our fully customizable training material today.